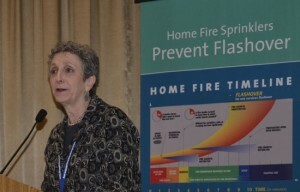 A key ally in the push for home sprinkler requirements, Massachusetts Rep. Ruth Balser has once again filed a bill calling for the installation of these devices in newly constructed one- and two-family homes in her state. The bill is currently co-sponsored by state Sen. Ken Donnelly. Follow Rep. Balser on Twitter-click @RepRuthBalser below.